We were checking out one of the fields when we came across a sad sight. Lots and lots of feathers strewn all over the grass. We were in the field where the owls are often seen and these were owl feathers. 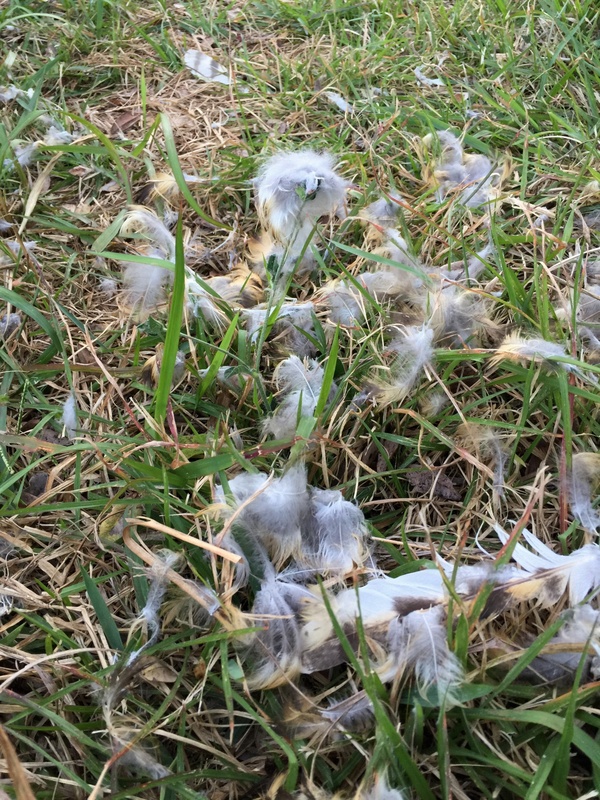 There were small, downy feathers on top of clumps of grass. There were a few big feathers. But there was no blood or any owl body parts. At first we were hoping that it was just feathers shed during very heavy molt. But, there were too many feathers for that. It was far more likely that the owl was killed and eaten by something. I showed the pictures to my birder friends from the Wild Bird Club of the Philippines and got some insights on the likely predator. Mark Jason Argallon: I saw the same situation in Mt. Pulag. Our guide said that the birds were eaten by cat. The feathers are already remnant of what has been eaten. Neon Rosell II: Looks like a kill from a cat family predator, they usually pluck the feathers off the birds before eating so there won’t be blood evidence, blood won’t be flowing anymore when they start eating after plucking its feathers. Two votes for a cat, but didn’t seem likely to be a domestic cat in this case since we don’t have any domestic cats on the farm. We are a bird sanctuary after all! Carmela Balcazar: Snakes swallow their prey whole and the manner in which prey are killed doesn’t require that their skin or feathers be removed. Possibly a musang/civet. Quite a struggle was put up. Even a young grass owl can give a good fight. A musang will drag its kill to a more secluded spot to eat in peace. Cats will choose easier prey to kill. Carmela Española: If it was all feathers without torn fleshy bits/bones then it could be an after meal mess by a resident snake. They swallow everything after a somewhat prolonged strangling session Was there just one clump of feathers or several and all along a trail? The latter I would interpret as a hunter dressing his catch while walking along a trail. This is a common sight in many of my study sites. Hope that helps. And then she added a comment when I showed her the pictures and said that they were taken inside our farm, so it was probably not a hunter. Carmela Española:The struggle before the big swallow can dislodge feathers. But it does seem like a lot of feathers in your photo. Another potential sizeable predator is the monitor lizard. I was strongly leaning towards a big snake as the culprit. Although a big monitor lizard would also fit the bill and be less intimidating to boot. 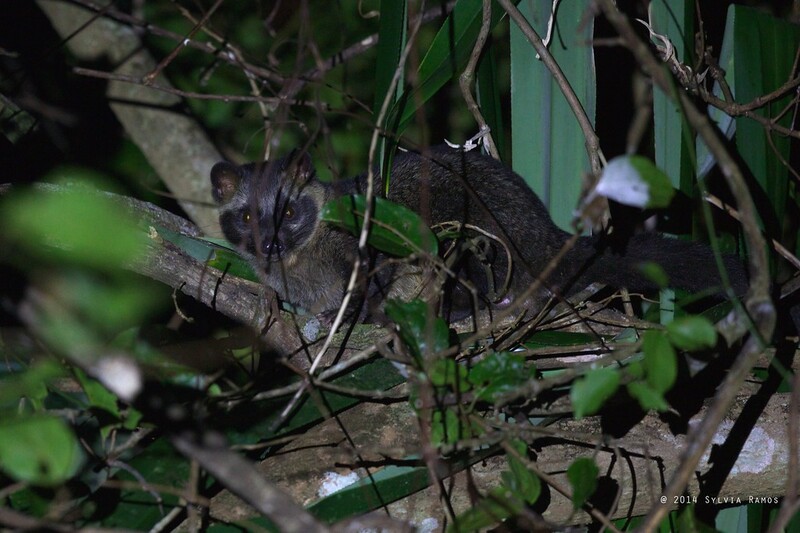 And then, the following week our caretaker Ruel reported that he saw a musang! The one he saw was dark on top with a pale chest. I think he saw the Asian Palm Civet, different from the kind with spots. Civets are well known for producing the once prized but now disdained Alamid coffee or kopi luwak. Well, this civet in our farm was no coffee bean consumer. 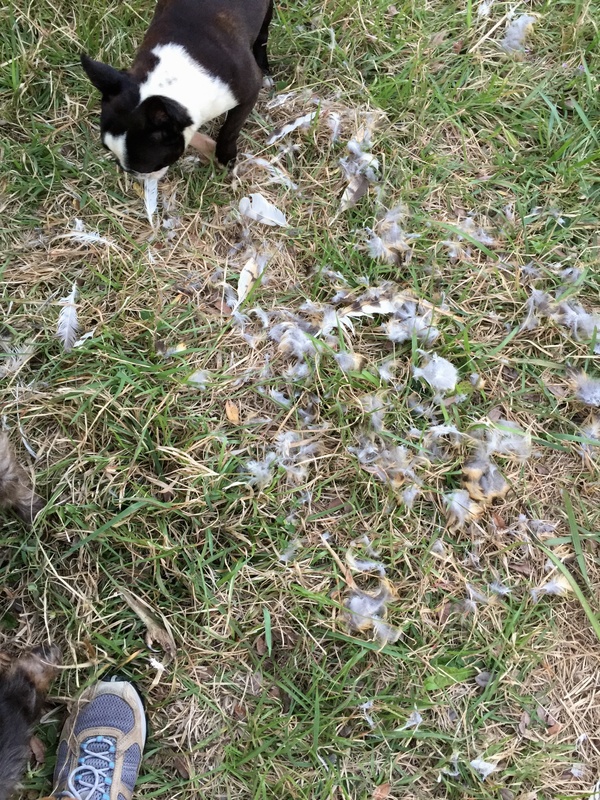 It ate all of our eggs, all of our hens, one rooster, and one Spotted Dove! This is what a musang looks like. Asian Palm Civet up in a tree in Palawan. 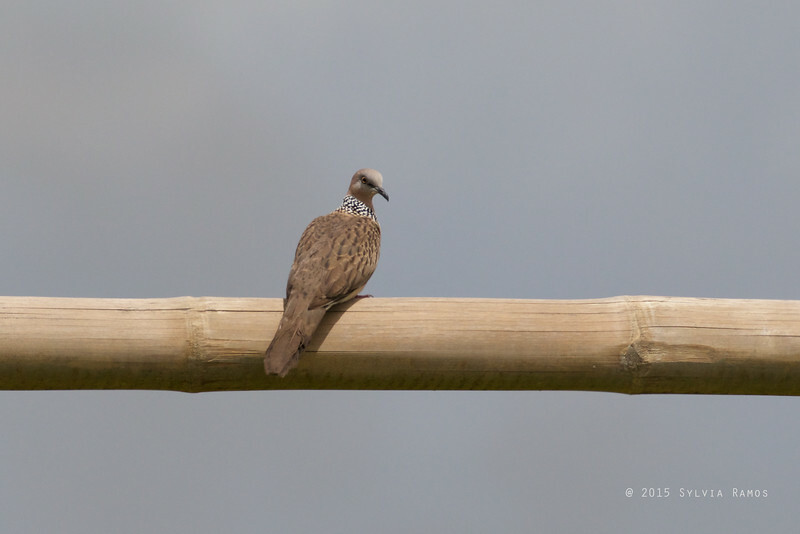 Here is a Spotted Dove in the farm. The mystery of the scattered feathers is solved. The musang probably ate the owl. It remains to be seen if there will be a sequel. Our caretaker Ruel was too scared to kill the musang. So it’s out there, somewhere. I’m glad Ruel didn’t kill it. It’s exciting to discover “new” mammals on the farm. But I’m also hoping it moved on to some other area. That is so scary for your dogs!! I’m not so worried about the musang getting the dogs since it’s nocturnal. I’m more concerned about the snakes. We try to stay out of their way and coexist by making paths and staying on the paths. Farm life! !